Perfect medium to use on all stamps. No heat required to complete projects. Water soluble, easy to clean! Versatile with many existing craft products. Our FlitterGlu has been uniquely developed by Kay to bring you a versatile, high quality stamping adhesive! Step 1: Add a teaspoon of glu to the white side of a small section of your phat foam. Step 2: Work the glu into your foam until it is no longer visible. 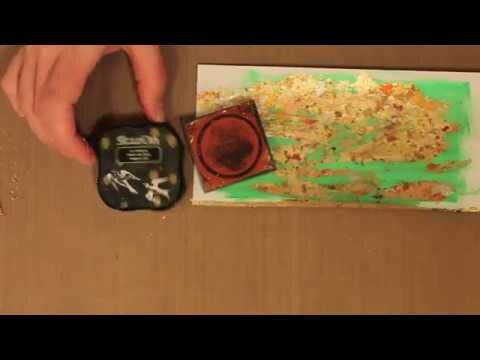 Step 3: Use your Glued foam as an ink pad to start stamping! This product works extremely well with our Mega-flakes which are now available in 13 colours. It also works well with Ultra Fine Glitter, Mica Powders, and Embossing mediums. Both our 120ml, and 50ml bottles are compatible with our Fineline applicators which can be screwed on to the tops. These applicators are ideal for creating delicate additions to any project.